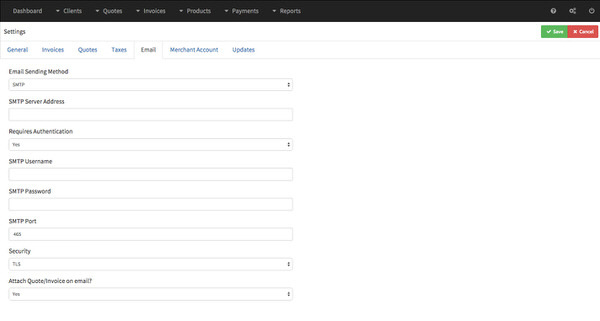 Before InvoicePlane can send emails you have to configure he email settings here. You can choose between three different ways to send emails. PHP Mail Uses the built-in email sending method of PHP which allows to send mails without any configuration. Sendmail Like PHP Mail all emails will be sent without the need to configure anything. Please choose Sendmail only if you are sure that your server has Sendmail installed, enabled and configured because it is possible that your servers OS does not ship with Sendmail by default. SMTP You can also use a SMTP server to send mails. Using SMTP allows you to send emails via external servers. You will need the SMTP server's hostname, login credentials and the used port and security method.